This post is a suggestion. Taking your child to a funeral is something that must be done when you feel it’s time. Not all children will be ready. And, as always these tips are mere advice and do not serve as any purpose on when your child is ready to go to a funeral. When a loved one dies it’s hard. But, when a loved one dies and you have children you’re often faced with the question, do I take kids to a funeral? For most people, the answer is often, no. But for my family, I feel the need to take my kids every where with me, so when someone dies, I never question should I? Just as my parents did, my children (yes, all 3 of them) go to every funeral we attend. Not because it is meant to scare them, but because it’s life. I want them to know about the circle of life. If you’re on the fence about taking your kids to a funeral, check out these reasons why I think it’s a good idea. It teaches kids about death. In a world where most children don’t learn about death until they are older, teaching kids that people die at a younger age is a good idea. Death shouldn’t be taboo subject and kids shouldn’t be scared to ask about it. Children need to be exposed to death sooner, rather than later because no matter how hard you try to control it, we’re all not promised tomorrow. Funerals are not as scary as we think they are to most children. When I was younger, my parents took me and my sisters to every funeral, just like I do with my children. One thing I learned is kids aren’t as scared as you would think they would be. When my children walked into a funeral for the first time, they were told what to expect, they knew why we were there, and warned about how they should act. And, when we walked up to the casket, they weren’t scared; they knew the person, instead they were curious and had lots of questions. It opens the door to serious questions. One thing taking a child to a funeral will do with any child is, open the door to many serious questions. For example, many people believe that when a person dies and immediately goes to heaven or hell. I don’t. And, for me, I’d rather teach my child what we believe, rather than them listening to someone else’s beliefs. I also think it’s a good time to address all things Death related with your child. It teaches them to appreciate all the people they do have. One of the questions my kiddos asked and probably many other children have asked is, does every one die? 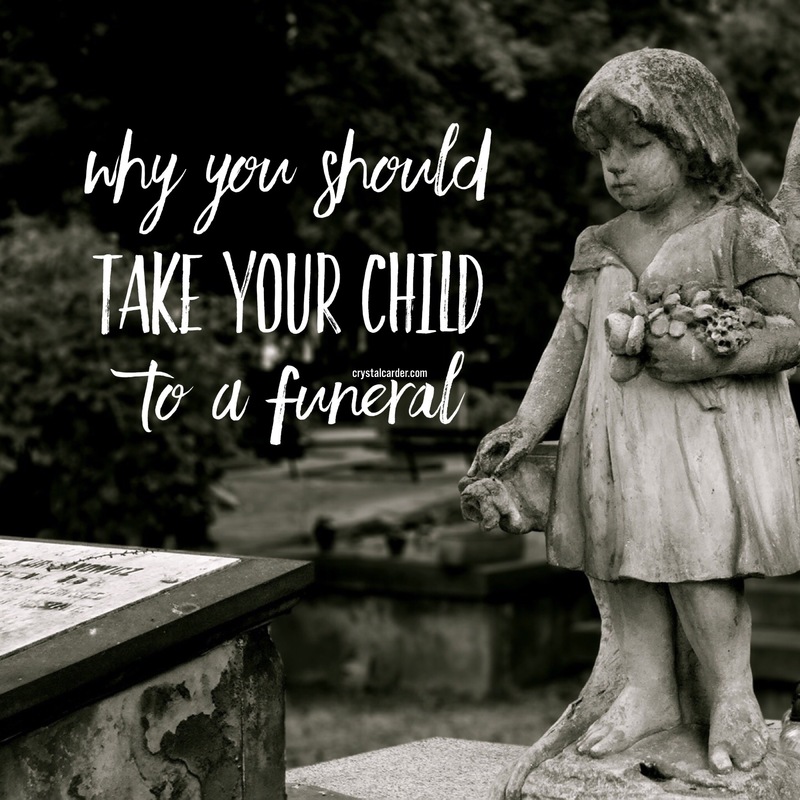 You could easily sit back and say no, but teaching your child about death is a good thing. They should know Grandma and pap are getting old or that so and so is gone because they died. It teaches your children to respect and love the people they have. Death and funerals need to stop being taboo to people with kids. It’s okay to talk about death with little ones. It’s natural, we can’t stop it. All we can do is teach our children to accept it. As always there are some circumstances when a child should not go to a funeral, please use discretion. Have you ever took your child to a funeral? What happened?